Bruno is mentioned by a prisoner at Vojenská nemocnice Hradčany who attempts to feign insanity by yelling day and night: "Giordano Bruno's fire is still smouldering, renew the process against Galileo!" Bruno was an Italian astronomer and philosopher who was burned as a heretic in 1600. Finally, in the year 2000 the Papal Cultural Council and a theological commission declared his execution as illegal. [1.8] Nejlepší,“ mínil jeden ze simulantů, „dá se simulovat šílenství. Z našeho učitelského sboru jsou vedle v cimře dva, jeden neustále křičí dnem i nocí: ,Hranice Giordana Bruna ještě dýmá, obnovte proces Galileův!’ a ten druhý štěká, napřed třikrát pomalu: haf - haf - haf, potom pětkrát rychle za sebou: hafhafhafhafhaf, a zas pomalu, a tak to jde neustále. Galilei is mentioned because a recruit at Vojenská nemocnice Hradčany was simulating madness by shouting day after day: "Giordano Bruno's fire is still smouldering, renew the process against Galileo!" Galilei was an Italian scientist, best known for his work in the fields of astronomy and physics. He is regarded as the founder of experimental natural sciences. The process that is mentioned in Švejk was a trial that was conducted in 1633 as a result of Galilei's book Dialogo sopra i due massimi sistemi del mondo (Dialogue concerning the two chief World Systems). The systems being discussed in the book is the heliocentric (Copernicus) and the geocentric (Ptolemy). 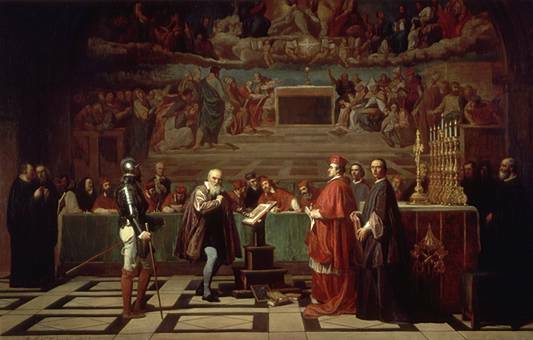 The book caused anger in clerical circles and Galilei was put before a papal court. Here he withdrew his theories and thus avoided being sentenced to death by burning. He was found guilty of heresy and abjurium, sentenced to life imprisonment, albeit soon converted to house arrest. Only in 1835 did the Catholic Church withdraw the ban of the book, but the final rehabilitation of the author only followed in 1992. Henčlů was a soldier from Hluboká who was given two years in prison after having informed members of parliament about maltreatment of soldiers. This is revealed in an anecdote Švejk tells his fellow malingerers at the military hospital at Hradčany. This story surely has some connection to real events, but attempts to pinpoint it directly have so far proved futile. Before the war there were several reports in the press about mistreatment of soldiers, and at least one involving IR91. [1.8] Nějakej ministr poslal k nám komisi, aby to vyšetřila, a nějakej Franta Henčlů ze Hluboký dostal potom dva roky, poněvadž to byl ten, co se vobrátil do Vídně k poslancům kvůli tý facce, kerou dostal na cvičišti od pana obršta. Military head doctors in 1906. Grünstein was head doctor at the garrison at Hradčany where the malingerers were undergoing treatment. Doctor Grünstein made sure they got the demon of sabotage exorcised by medical means like quinine, aspirin, enema, stomach pumping and a strict diet. See Vojenská nemocnice Hradčany. Grünstein probably doesn't have an obvious model from real life. Although Hašek was in a military hospital in 1915, this was in Budějovice. Any person that may have served as inspiration for Grünstein may better be looked for there and not in Prague. That said, Jaroslav Hašek could also have been inspired by stories he heard of without knowing the person. We know that the head medic at Hradčany in 1916 was Dr. Josef Krejčí, and that his superior at the main military hospital at Karlovo náměstí was the cruel and mentally unstable Dr. Franz Halbhuber. The latter was notoriously known and Jaroslav Hašek probably knew about him. As such Halbhuber may well have lent his dubious qualities to both Grünstein and Bautze. Macuna was one of the malingerer who was called up for treatment by Grünstein. He was treated with anema and aspirin. See Vojenská nemocnice Hradčany. Pokorný was one of the malingerer who was called up for treatment by Grünstein. He was treated with stomach pumping and quinine. See Vojenská nemocnice Hradčany. Kovařík was one of the malingerer who was called up for treatment by Grünstein. He was given enema and aspirin. But soon after he quietly, from his bed by the window, he suddenly reported fit for duty, and Grünstein awarded him with an enema for the road. See Vojenská nemocnice Hradčany. [1.8] "Poslušně hlásím, pane obrarct," ozvalo se tiše od postele u okna, "já už jsem zdravej, já už v noci pozoroval, že mne záducha přešla." "Jmenujete se?" "Kovařík, poslušně hlásím, mám dostat klystýr:" "Dobře, klystýr dostanete ještě na cestu," rozhodl dr. Grünstein, "abyste si nestěžoval, že jsme vás tady neléčili". Koťátko was one of the malingerer who was called up for treatment by Grünstein. He was treated with stomach pumping and quinine. See Vojenská nemocnice Hradčany. [1.8] „Vypláchnout žaludek a chinin! - Kovařík? !“ „Zde!“ „Klystýr a aspirin! - Koťátko? !“ „Zde!“ „Vypláchnout žaludek a chinin!“ A tak to šlo, jeden za druhým, bez milosti, mechanicky, řízně. Socrates is mentioned because not even he emptied the poison chalice with such calm as Švejk drank quinine. Socrates was a Greek philosopher, one of the all time greats, and regarded as one of the founders of Western philosophy. The outspoken philosopher was late is his life accused and convicted of impiety and having corrupted the youth. He was sentenced to either exile from Athens or to take his own life by a method of his own choice. He chose the latter by emptying a chalice of poison. [1.8] Ani Sokrates nepil svou číši bolehlavu s takovým klidem jako chinin Švejk, na kterém vyzkoušel dr Grünstein všechny stupně trápení. Botzenheim was a general's widow who had read about Švejk in Bohemia. The editor had urged readers to collect money for the brave cripple, who brimming with patriotism was pushed to mustering in a wheelchair. The baroness brought splendid gifts for Švejk, amongst them a bottle of war liquor with the inscription Gott Strafe England! The author mocks the poor Czech of the German-speaking baroness and her visit ranks amongst the most famous episodes of the novel. [1.8] V té době měla vdova po generálovi pěchoty baronka von Botzenheim velice mnoho starostí, aby vypátrala toho vojáka, o kterém uveřejnila nedávno Bohemie zprávu, jak se dal vozit, on, mrzák, na vozíku pro nemocné a křičel: „Na Bělehrad!“, kterýž vlastenecký projev dal původ redakci „Bohemie“ k vyzvání čtenářů, aby konali sbírky ve prospěch loyálního hrdiny-mrzáka. Otakar Filip was probably the person the narrator had in mind as, quote: author of Stories from the life of our monarch and editor in chief of Československá Republika. Otakar Filip was a Czech journalist. author, and illustrator, and long time editor of local news in official newspapers that were published in Prague both under Austria-Hungary and Czechoslovakia. The book that is referred to he actually wrote, albeit with a title that differs somewhat from the one given in the novel. It was published in 1910 and contained 242 pages. That he was editor in chief of Československá Republika isn't entirely true, he was one of the board of editors. Filip specialised in reports and literature about Prague and published several books. See also Pražské úřední noviny. The full title of the book Jaroslav Hašek refers to was: Osmdesátiletý mocnář: Význačné události a zajímavé obrazy ze života jeho veličenstva císaře a krále Františka Josefa I. Translated: The eighy year old monarch: significant events and interesting pictures from the life of His Majesty Emperor and King Franz Josef I. On 18 August 1915, ironically on the very day that Jaroslav Hašek was awarded the small silver medal for bravery, an advert for a patriotic book appeared in his home town. It was titled The supreme protector of Czech children, His Highness Emperor and King Franz Joseph I. and written by none other than our editor Filip! [1.8] Vše elegantně rozložila na prázdnou postel vedle Švejka, kam přibyla ještě pěkně vázaná kniha „Příběhy ze života našeho mocnáře“, kterou napsal nynější zasloužilý šéfredaktor naší úřední „Československé republiky“, který se ve starém Frantíkovi viděl. Shrapnel is mentioned indirectly through the term shrapnel as baroness von Botzenheim and her entourage enter the sick-ward of the malingerers at Hradčany. As the novel progresses his name, or rather his invention, crops up several times in various stories from the fighting. Shrapnel was a British officer and inventor who is famous for having invented the shrapnel shell, a shell filled with metal fragments. It turned out to be an effective anti-personnel weapon. The method was in use from the Napoleonic wars until the end of WW1. [1.8] Ani arcikněžna nemohla tak vážně vejít, jako to udělala baronka von Botzenheim. Za ní valil se celý průvod, ve kterém nescházel ani účetní šikovatel při nemocnici, který v tom všem viděl tajemnou ruku revise, která ho od tučného žlabu v týlu hodí napospas šrapnelům někam pod drátěné překážky posic. [1.14.2] V tom okamžiku zapomínal, že sviští mu nad hlavou granáty a šrapnely, a probíral se neúnavně se zavazadly ke štábu, kde stálo vozatajstvo. Johann was the servant of Baroness von Botzenheim and looked like the murderer Babinský. [1.8] Ja čist všekno f nófiny, já vám přinest pápat, kousat, kuřit, cucat, cešky fójak, toprá fójak. Johann, kommen Sie her!„ Komorník, připomínající svými ježatými licousy Babinského, přitáhl objemný koš k posteli, zatímco společnice staré baronky, vysoká dáma s uplakanou tváří, sedla si na Švejkovu postel a urovnávala mu slaměný polštář pod záda, s fixní myšlenkou, že se to patří dělat nemocným hrdinům. Babinský is mentioned because Johann, the servant of Baronesse von Botzenheim, looked like him. Babinský was a Czech criminal, sentenced for a series of murders and a number of other crimes. He is one of the best known Czech criminals ever and E.E. Kisch devotes a whole chapter to him in his Die Abenteuer in Prag. A lot of space was devoted to him in the police museum. [1.8] Komorník, připomínající svými ježatými licousy Babinského, přitáhl objemný koš k posteli, zatímco společnice staré baronky, vysoká dáma s uplakanou tváří, sedla si na Švejkovu postel a urovnávala mu slaměný polštář pod záda, s fixní myšlenkou, že se to patří dělat nemocným hrdinům. Wilhelm II. is mentioned because he is pictured with emperor Franz Joseph I on a bottle of "Kriegslikör" (war liquor). This was one of the gifts Baroness von Botzenheim bestowed the good soldier during her visit at the garrison hospital at Hradčany. Wilhelm II. was German emperor from 1888 until 1918. He was the last emperor of Germany and the last king of Prussia. He was forced to abdicate in 1918 after the defeat in World War 1, and lived the rest of his life in the Netherlands. Wilhelm had family relations with the rulers of both England and Russia. [1.8] Baronka zatím vytahovala dárky z koše. Tucet pečených kuřat, zabalených do růžového hedvábného papíru a ovázaných černožlutou hedvábnou stužkou, dvě láhve nějakého válečného likéru s etiketou „Gott strafe England!“ Na druhé straně byl na etiketě František Josef s Vilémem, jak se drží za ruce, jakoby si chtěli hrát hru „Králíček v své jamce seděl sám, ubožátko, co je ti, že nemůžeš skákati“. Eugen is mentioned by a young doctor who attempts a rousing speech to the malingerers and points to prince Eugen and field marshal Radetzky as glorious military role models. 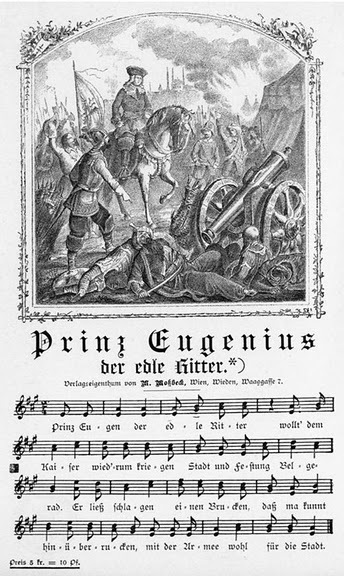 Eugen also appears at the end of [II.2] in the song that Marek and Švejk sing in the cell at Mariánská kasárna (Prinz Eugen, der edle Ritter). Moreover the song is partly quoted in [III.1] when soldiers from the march battalion of the Deutschmeister regiment sing it on their way through Győr. See Zemun. Eugen was an Austrian prince and field commander. He gets most of the credit for the successful military operations against the Ottomans from the siege of Vienna in 1683 to the peace treaty of Sremski Karlovci in 1699. The song however refers to an event that took place much later: the siege of Belgrade in 1717. The full name of the French born prince was Eugène-François de Savoie. [1.8] Mluvil dlouho o tom, že každý z těch, kteří opouští nemocnici, aby odešli ke svým plukům do pole, musí být vítězem i rytířem. On že jest přesvědčen, že budou zruční ve zbrani, na bojišti i čestní ve všech záležitostech válečných i soukromých. Že budou nepřemožitelnými válečníky, pamětlivými na slávu Radeckého i prince Eugena Savojského. [I.12] V zápalu a v řečnickém rozmachu vydával polní kurát i prince Evžena Savojského za světce, který je bude chránit, až budou dělat mosty přes řeky.